Ras Kikadini is idyllic, original, private, remote – and very hard to leave. Set on an unspoilt 12-acre plot with its own private beach, this charming, newly-refurbished house is the ideal spot in which to relax and unwind in absolute peace and harmony with nature. A beach house with a difference, Ras Kikadini is only 10 miles south of Mombasa Island and 6 miles north of Diani airstrip – but a world away from bright lights and big city. It sits in a peaceful and secluded 12-acre oceanfront sanctuary – home to indigenous forest, tsuni antelope, dwarf mongoose, monitor lizards and a huge variety of birdlife. From the house, mature tropical gardens dotted with huge old frangipani and palm trees lead down to a completely private white-sand beach cove with cliffs above. Here guests can swim, sunbathe, snorkel and beachcomb in peace and privacy. The beach hosts Green Turtle hatchings every month. Built in the middle of the last century and completely renovated and refurbished in 2016, the house is decorated in keeping with the 1950s look that the new owners inherited. It blends one-off furniture designs and retro photographs, clean lines and colourful tropical prints to stylish and original effect. The house accommodates up to eleven guests in three Ground Floor bedrooms and an upstairs loft. All the Ground Floor rooms have concertina doors opening onto the garden terrace. One Sea View Bedroom is ensuite with a King-size double bed and an extra optional single couch bed. The second Sea View bedroom has a King-size double bed and separate bathroom. The Garden View Bedroom has two Queen-size double beds and ensuite bathroom. Downstairs there is a lofty central dining and living space, and 12 guests can be seated comfortably at the custom-made, antique-wood dining table. On either side of the dining area there are two separate sitting areas plus bar area and large drinks fridge. There are great views from this room with its open panoramic windows. Experienced host and chef Michael specialises in delicious and healthy meals, including of course excellent freshly-caught local fish and seafood. Suggested menus and shopping lists can be sent to guests before they arrive and shopping is best done in Diani or Mombasa on the way to the house – there are no shops nearby and once you arrive at the house you really won’t want to leave. At Ras Kikadini there is also a total absence of restaurants, beach bars, beach boys, tourists, noise, distractions and intrusions – making it the ideal retreat for anyone who really wants to escape, slow down and enjoy a simpler, quieter way of life for a while. As well as relaxing gatherings of family and friends Ras Kikadini is the ideal venue for weddings, private parties and yoga or health retreats. There are additional accommodation options next door and nearby, as well as a large catering-style kitchen with 2 large stores, guest staff accommodation and plenty of parking. All kinds of equipment – from yoga mats to a dance floor – is also available to rent for functions and events. 1 bedroom with King-size bed, single bed and ensuite bathroom. Considering its relative proximity to Mombasa and Diani, Tiwi Beach is still genuinely unspoilt and un-touristy, with virtually no large beach resorts or beach hotels, bars, restaurants or supermarkets. This makes it an ideal location for anyone looking for a traditional beach holiday in a lovely, peaceful and relaxing location. The reef lies just offshore, and there is excellent snorkelling at high tide, especially at the northern end of the beach. 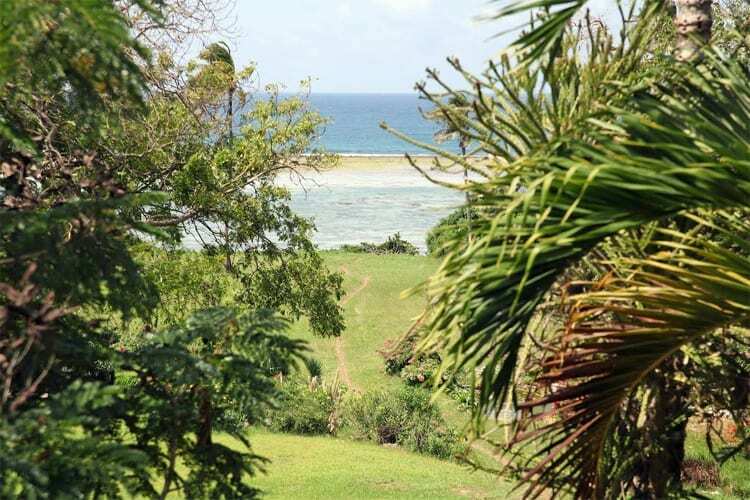 In the dry season, one can walk to the southern end of Tiwi Beach and wade across the Mwachema River to Diani and the Kongo Mosque, said to be the oldest in East Africa. A Tiwi curiosity is the Africa Pool – a rock pool whose shape resembles Africa at low tide. Tiwi is well placed for day trips inland to the dramatic scenery of the Shimba Hills National Reserve, home to the endangered Sable Antelope, and to the nearby Mwaluganje Elephant Sanctuary and Sheldrick’s Falls. Ras Kikadini is approximately 12 miles south of Mombasa Island via the Likoni Ferry and the main A17 coastal road. Please contact us for detailed directions. Driving Time from Nairobi should be around 8 hours.